(Mens L) Ugly Xmas Sweatshirt! Red w/ Mickey Mouse Santa & A Big Sack of Presents! Home > Ugly Christmas Sweaters > Ugly Christmas Sweatshirts > (Mens L) Ugly Xmas Sweatshirt! Red w/ Mickey Mouse Santa & A Big Sack of Presents! Vintage ugly Christmas sweatshirt! Red sweatshirt with puffy paint Mickey Mouse dressed as Santa on the back & front of the sweatshirt! 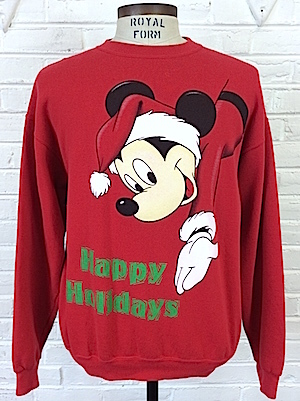 The front of the sweatshirt shows Mickey Santa hanging down from the top of the shirt with the words "Happy Holidays� next to his hand. 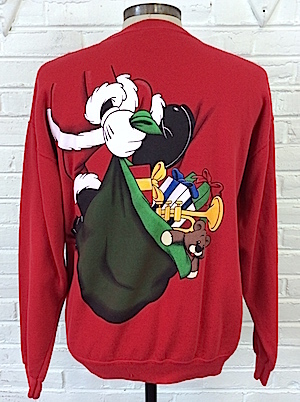 The back of the sweater reveals that Mickey Santa has a big bag of toys ready to be delivered! The right sleeve reads "Seasons" and the left sleeve reads "Greetings". Tagged by Disney Designs. Polyester/Cotton blend. Made in the U.S.A. Sleeves: 33" collar to cuff.